Dear reader, please allow me the honor of introducing you to a very special bird; a bird whose type is classified as a Northern Flicker. He/she is a bird I was introduced to yesterday, and can be seen in the first photo accompanying this Blogger entry. 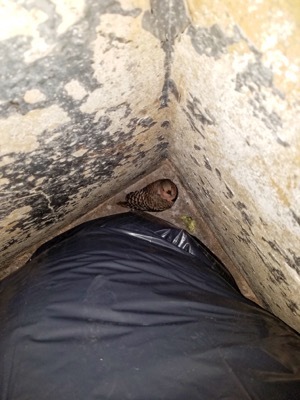 In the image you can see the Northern Flicker cowering behind some trash bags. The bags were in the alleyway of a building down the street from where I live (on the Upper Westside of New York City). The photograph was taken by the superintendent (or super as we say in NYC) of that building. Evidently he happened to discover the bird while he was performing routine chores for the building where he works. And here's how I became involved: I had asked this super to do a favor for me which was to allow some packages to be delivered to his building, as there is no doorman where I live, and receiving parcels can be a problem for me. 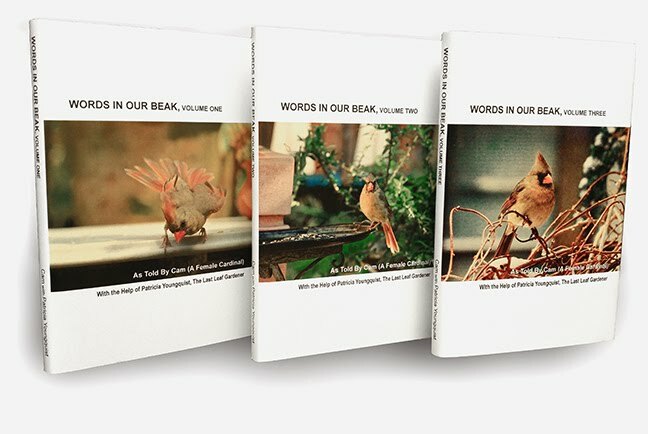 The contents of the packages were products that had been sent to me by Duncraft, a company that is a pioneer in manufacturing products for those who do "backyard birding." When I went to retrieve the cartons that had been sent to me, the super told me had spotted an injured bird near the garbage bags that were at the back of his building. The super had known about my interest in birds because of the digital book, Words In Our Beak Volume One. I wrote in the voice of a female cardinal named Cam. This made him suspect that I might know how the injured bird could be treated. 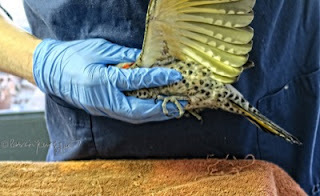 As destiny for the sweet Northern Flicker seemed to have it, I did know where the bird could be taken for treatment. 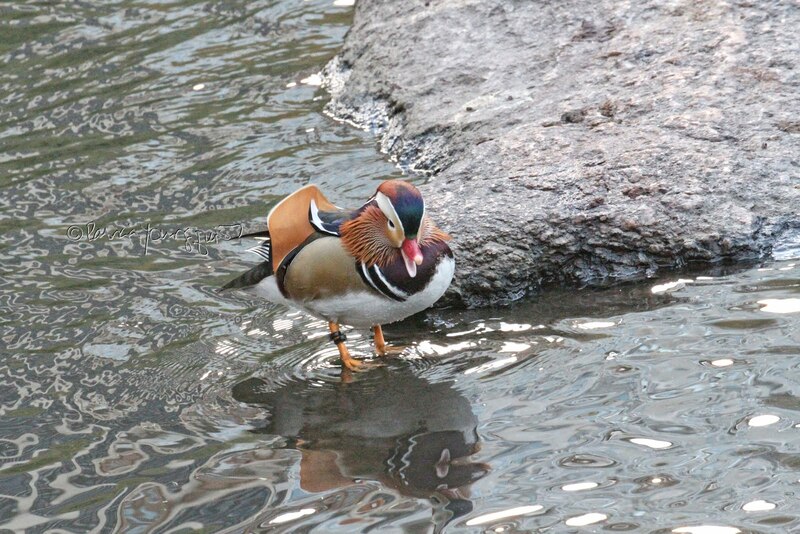 The place I had in mind was The Wild Bird Fund (WBF), which is also located on Manhattan's Upper Westside. I am familiar with The WBF for I've been there on a number of occasions; including a time when I participated in the rescue of a bird that had fallen ill, and was taking refuge in my garden. That particular situation had occurred on Holy Thursday, April 2, 2015. 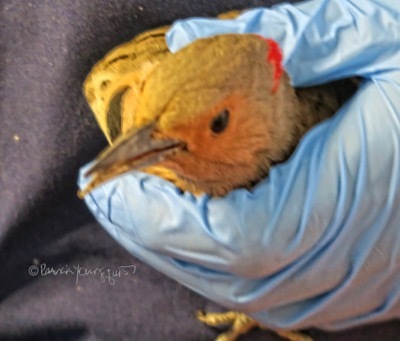 So it has only been a little over a year since I last played a role in helping an injured bird to get the needed treatment for recovery. 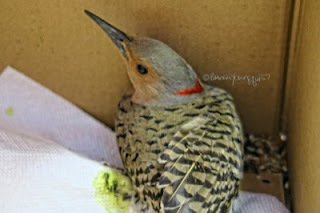 The what-to-do-when-one-sees-an-injured-bird particulars were still fresh in my mind when the super showed me the Northern Flicker. The bird which I had been able to rescue last year was a pigeon. I had done the rescuing with the help of RB (my friend's husband who happens to volunteer for The WBF). That pigeon, unbeknownst to me had a case of lead poisoning. He/she most likely got it from eating paint chips at a nearby brownstone that was being overhauled/renovated. I had named that particular bird Thursday, not because it was Holy Thursday, but because of the line in the nursery rhyme, "Monday's child is fair of face...". The line I'm referring to goes like this: "Thursday's child has far to go." When one brings a bird to The WBF, the folks working there give the bird the name of the person who brought the bird to them. In Thursday's case, they changed his name to Ritchie in honor of RB for his participation in the rescue. I had told the super that while I would carry the Northern Flicker to The WBF, I thought that they should give the bird the super's name. The super has an unusual and unique name, but he preferred to be anonymous in offering it as a namesake, and suggested we call the bird Super. 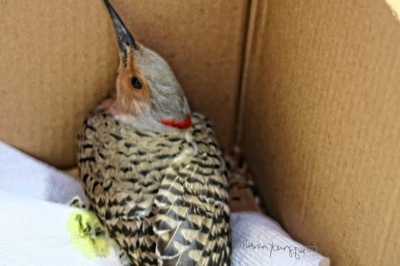 With that in mind, I helped the superintendent in getting the Northern Flicker into a box (as seen in the images below), so I could carry him to The WBF. Soon after I arrived at The WBF, Super was evaluated by the staff, including The WBF's founder, Rita McMahon and an avian medical expert named Eugene. I was able to get a few pictures (as seen in the following pictures) of Eugene giving Super a check-up, but I limited the number of photos I took as I did not want to cause Super any more stress. As of this posting, it appears that Super probably sustained injures as a result of crashing into the window of a building. Super is a migratory bird and it is far too common for migrating birds to crash into windows as they make their journey. In any event, Eugene seemed optimistic about Super's prognosis as the bird's eyes were bright and he was very alert. However, Eugene cautioned me that he did not want to give me false hope. The WBF still needed to determine if Super had a concussion or brain damage as a result of his apparently crashing into a window. If Super makes a full recovery he will be released into Central Park and I hope The WBF will contact me so that the superintendent and I can attend and wish our feathered friend a bon-voyage.